Interstate 90 (I-90) is the longest Interstate Highway in the United States at 3,101.13 miles and is the northernmost coast-to-coast interstate. The eastern terminus is at Route 1A near Logan International Airport in Boston, Massachusetts. The western terminus is at Edgar Martinez Drive S. near Safeco Field and CenturyLink Field in Seattle, Washington. Locally, Interstate 90 connects motorists from O’Hare International Airport, the northwest suburbs, and the far northwest suburbs to Chicago city neighborhoods on the northwest side and to downtown Chicago — especially via the Ohio feeder ramp. Mile Markers start at the Illinois-Wisconsin State Line and accumulate eastbound. Interstate 90 passes at the southern border of Arlington Heights and its full stretch through Arlington Heights is a tollway known as the Jane Addams Memorial Tollway — a 79-mile (127-kilometer) segment of Interstate 90 from Interstate 190 in far northwest Chicago to Illinois Route 75, one mile (1.6 km) south of the Wisconsin state line. The tollway was built in the late 1950s and early 1960s from the O’Hare area (at the Tri-State Tollway) to the Wisconsin state line north of Rockford, and was known as the Northwest Tollway until September 7, 2007. The Jane Addams Memorial Tollway is named for sociologist, activist, and author Jane Addams. Interstate 90 exits in Arlington Heights at Arlington Heights Road for eastbound and westbound traffic with stoplights at the bottom of each ramp. There is a toll plaza on the eastbound exit ramp. The full interchange is located between the 70.5 mile marker and the 71 mile marker. 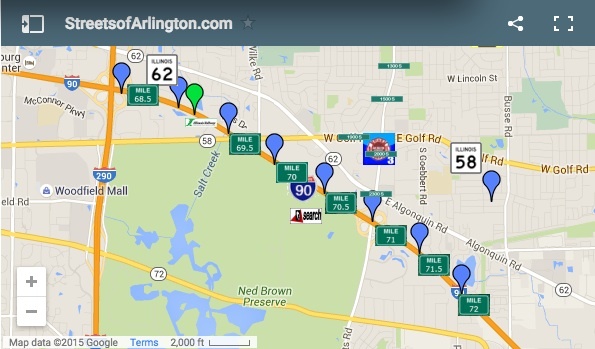 There is an on ramp for southbound Arlington Heights Road to westbound Interstate 90, and there is an on ramp for southbound Arlington Heights Road to eastbound Interstate 90. There is an on ramp for northbound Arlington Heights Road to eastbound I-90, and there is an on ramp for northbound Arlington Heights Road to westbound I-90. The next interchange to the west is a full cloverleaf interchange at I-290/IL53. Southbound I-290/IL 53 accesses eastern Schaumburg and Woodfield Mall, the western suburbs proceeding south to I-355, and to the City of Chicago and near west suburbs via eastbound I-290. The next interchange to the east is about 7 miles (7 minutes) distance at the I-294/I-190 interchange. Access to southbound I-294 and I-190 involves the same right lane exit with I-190 splitting off before I-294. Access to northbound I-294 involves an exit ramp on the right immediately past the I-294 overpass. There are two overhead oases on the Jane Addams Tollway—one at Belvidere, and one in Des Plaines near O’Hare International Airport. From O’Hare International Airport to Huntley, the region along the sides of the Jane Addams Tollway is known as the “Golden Corridor”, due to the proximity of commercial and business activity located along the corridor in Northwest Suburban Chicago, including Des Plaines, Elk Grove Village, Arlington Heights, Rolling Meadows, Schaumburg, Hoffman Estates, Barrington, and Huntley. Several Fortune 500 companies, large malls, hotels, entertainment and exhibition facilities, restaurants, and retailers (including Woodfield Mall and Huntley Outlet Center) are located along the corridor, providing a “gold” mine of profit to communities along the Golden Corridor. The John F. Kennedy Expressway is a 17.8-mile (28.65 km) long highway that travels between the Chicago Loop to O’Hare International Airport — including Interstate 190. The official endpoints of the “Kennedy Expressway” are the Circle Interchange with Interstate 290 (Eisenhower Expressway/Congress Parkway) and the Dan Ryan Expressway (also I-90/94) at the east end, and the O’Hare Airport terminals at the west end. The Interstate 190 portion of the Kennedy is 3.07 miles (4.94 kilometers) long and was built to serve airport traffic at the main terminals of O’Hare International Airport. Traveling south, the Kennedy Expressway becomes the Dan Ryan Expressway (I-90/I-94). The interchange allows travel westbound on the Eisenhower Expressway (I-290) or eastbound on Congress Parkway. The Eisenhower Expressway ends and begins at Congress Parkway — an east-west city street east of the Circle Interchange. The “Kennedy Expressway” is named for the 35th U.S. President, John F. Kennedy.